As summer draws to a close and the tourist hordes thin, a bizarre visitor starts appearing more frequently in the Monterey Bay National Marine Sanctuary. The ocean sunfish, Mola mola, is sighted here year-round, however September through November provide the most likely chances for encountering these uniquely shaped open ocean travelers. With a strikingly abridged appearance, molas are the worlds heaviest bony fish, growing over 5000 pounds on a diet primarily of jellyfish. Despite their remarkable appearance, exactly where these leviathans travel, feed, mature, and reproduce remain mysteries. In 2000, with help from National Geographic, Monterey Bay Aquarium and others, our team began conducting mola research using genetics and satellite tagging technology. Genetic analyses have been conducted at the University of South Florida under the direction of Steve Karl with assistance from J. Todd Streelman and Anna Bass. I am joined on the domestic satellite tagging team by John OSullivan, Heidi Dewar, Chuck Farwell, Brett Hobson and Eddie Kisfaludy. (For individual affiliations see:acknowledgements). Our genetic results thus far have been fascinating. Between the Atlantic and Pacific oceans, Mola mola populations appear clearly divided while intra-oceanic differences between northern and southern hemispheres appear nominal. More extensive analyses of South Pacific and North Atlantic samples will further clarify these preliminary findings. Globally, we have located several significantly genetically divergent individuals from Australia and South Africa and these likely represent two brand new ocean sunfish species! Our California Mola mola population analyses have yielded very interesting results. We looked at a special group of genes known as microsatellites. These genes are commonly highly variable in fish and can provide a genetic fingerprint of individuals. Surprisingly, there are a larger number of individuals sharing similar fingerprints than we expected. Although our results are preliminary and there are several things that might cause this, it is consistent with early indications that the population size has recently been reduced possibly due to fishing pressure. We need to collect more data before we can be sure of the direct cause of the modest loss of genetic variation, but these findings advance significantly our knowledge of these unique creatures. Unfortunately, Mola mola comprise over 25% of the California drift net bycatch--the single largest species component according to Rand Rasmussen of the Southwest Fisheries Science Center. While these low energy, passive fish appear to survive their time in the nets, we have little way of gauging the long-term survival of individuals that have been caught and released. With more extensive genetic analyses, we can start to decipher if these extensive incidental captures may be adversely affecting our California population. Our tagging efforts are revealing individual daily movements and diving behaviors using pop up satellite archival tags (PSAT). These tags record temperature, depth and light intensity from which location is deduced. At a preprogrammed time, the PSAT releases from the animal to the surface. There it transmits data to orbiting Argos satellites, which relay the data to a ground station and to our computers. The beauty of this technique is that we can collect large amounts of data without having to bother the fish again. Additionally, since the tag is on for several months to years, the fish has time to recover from the tagging event and presumably display normal behavior patterns. In Fall 2000, we tagged four individuals off San Diego and acquired data from one fishs movements between August 00 and March 01. This mola traveled south to the middle of the Baja peninsula then returned north to Catalina Island where the tag released on March 17th as planned. (Figure 1). 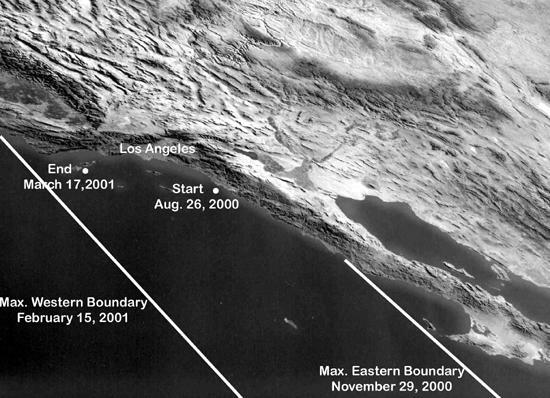 Figure 1 Movement of satellite tagged Mola mola 18567 off the coast of southern California and Baja between August 2000 and March 2001. Lines indicate longitudinal limits of movement. The fishs dive behavior depended on location. In August, it spent half its time in the upper 5 meters (80% above 40 m). It rarely forayed into deeper water below 200 meters. Moving southward, its time in deep water increased. By October, it spent half its time between 10-40 meters and nearly a quarter of its time between 100-300 meters. In December, it spent a quarter of its time between 40-60 meters and approximately 40% of its time below 200 meters. By March, returning north, the fish split its time between 10-20 meters and 100-200 meters (Figure 2). While most time was spent above 10šC (>60%) the mola also frequented temperatures below 7.5šC (>16%) (Figure 3). Together these temperature depth data suggest the fish may have been making repeated forays to the deep scattering layer, returning to the upper waters to thermally recharge. Its decreased time in the upper 5 meters between Oct-March may be related to surface wave action that typically increases during winter months. Additional tags and data will allow us to further test these two hypotheses. In August 2003, our team deployed another six tags off San Diego, five as part of the Tagging of Pacific Pelagics --Census of Marine Life Project http://www.coml.org/descrip/topp.htm. These tags will release in spring 2004. Our ultimate aim is to combine tagging data with regional oceanographic data, fisheries observers sightings and aerial censuses to deduce how Mola mola are using the California current. We hope our long-term tracking work will shed insight into diurnal behaviors as well as seasonal movement patterns. With this knowledge, fishermen and managers may be able to reduce the amount of mola bycatch. Our California work is part of a global effort to track ocean sunfish and record species prevalence and distribution in all tropical and temperate oceans. To date, we have satellite tagged 22 individuals in California, Japan, South Africa and Australia including 5 sharp-tailed mola Masturus lanceolatus in Taiwan. Next September, we will tag Mola mola in Bali, Indonesia. Taken together, our genetic and tagging efforts are beginning to reveal the intimate details of the mysterious mola and its role in the open ocean ecosystem.